You all should know about my obsession with cauliflower by now. I whip up this cauliflower pasta at least two times a week, but in addition to that I also make cauliflower-crusted pizza, cauliflower fritters, cauliflower soup, etc. I can’t get enough! What’s so great about cauliflower is it completely takes on the flavors of whatever you cook it with, making it taste almost nothing like a vegetable. I can enjoy a lot of my favorite dishes and cuisines without breaking my diet! Cauliflower is also one of the easiest things to whip up for a recipe, since most of the time all you have to do is throw it in the oven or on the stove. It makes my weeknight cooking effortless and stress-free! If you follow me on SnapChat, you’ll also know I have a particular fondness for Tex-Mex. I crave it on the reg, especially tacos, queso and guac. While there really aren’t many ways to make queso less unhealthy (especially without making it taste bad), I can whip up guacamole and a healthier version of tacos that is delicious and flavorful. Also… a guilt-free taco? Sign. Me. Up. I’m not sure about you guys, but we always have Tex-Mex the week of Christmas. For us it’s usually on Christmas Eve for either brunch or a casual dinner. It’s an easy-to-please cuisine that has an abundance of flavors and different things you can mix and match for your meal: tamales, tacos, enchilandas, queso, guac, fajitas, the list goes on! For a healthy, yummy and incredibly easy Tex-Mex meal this holiday season, try this recipe for cauliflower tacos. The sauce is slightly tangy with a solid balance of sweet and spicy, so I was looking for a mild cheese to cut the tangy-ness of the sauce. While perusing the cheese aisle at H-E-B, I found a wheel of La Vaquita Signature Queso Fresco and thought I’d give it a try! 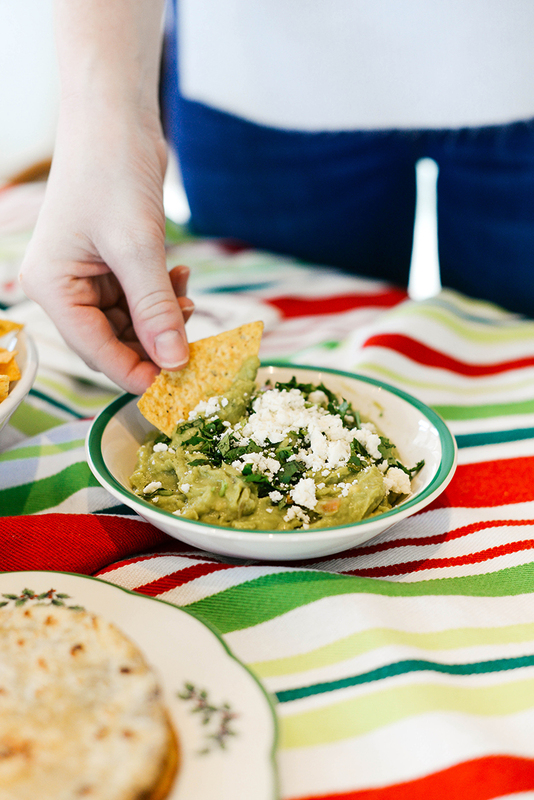 It’s a local Texas brand with a Mexican heritage, so truly a Tex-Mex brand, wouldn’t you say? The smooth, mild flavor of La Vaquita’s queso fresco compliments just about any dish (especially this one!)! In addition to being a tasty element to add more flavor to your meals, La Vaquita Signature Queso Fresco elevates the presentation of your creations too – the crumbled cheese adds a bit of authentic flair and texture to apps and side dishes like hummus, Brussels sprouts, Mexican street corn, and more. I’m pretty terrible at food presentation, so I really enjoy how the crumbled cheese effortlessly adds a sophisticated touch to the various dishes I whip up. 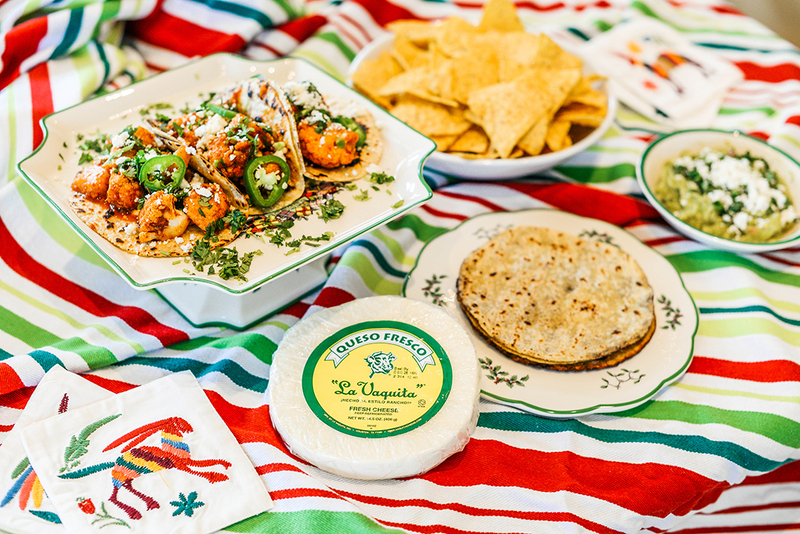 Texas-born La Vaquita quesos and cremas can be found at H-E-B, Kroger, Fiesta, Walmart and more local grocers throughout Texas, so give it a try this holiday season and let me know what you think! 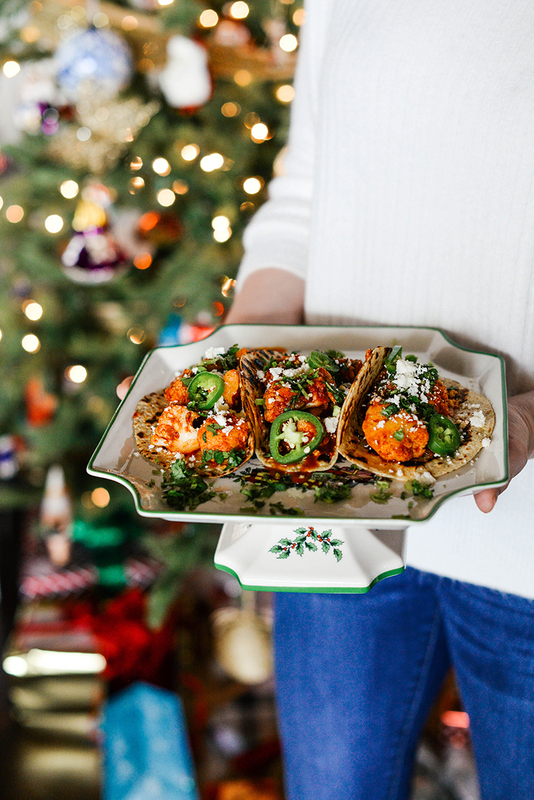 Click here to discover more recipes and inspiration on how to incorporate La Vaquita into your family’s favorite recipes and holiday traditions. In a food processor combine the garlic, chili powder, paprika, chipotle chilies, pineapple juice, vinegar and 1 cup of the pineapple chunks. Blend until smooth. Set the pineapple sauce aside. Heat a large skillet over medium-high heat and add the olive oil. Add the cauliflower and onions, season with salt + pepper. Cook for 15 minutes or until the cauliflower is tender and the onions are caramelized. Reduce the heat to low and stir in the pineapple sauce, the remaining cup of pineapple chunks and the jalapeno. Simmer for 8-10 minutes or until the sauce has reduced and coats the cauliflower. Remove from heat and stir in the cilantro. In a separate pan, pan-fry individual tortillas on med-high heat until warm and slightly browned. 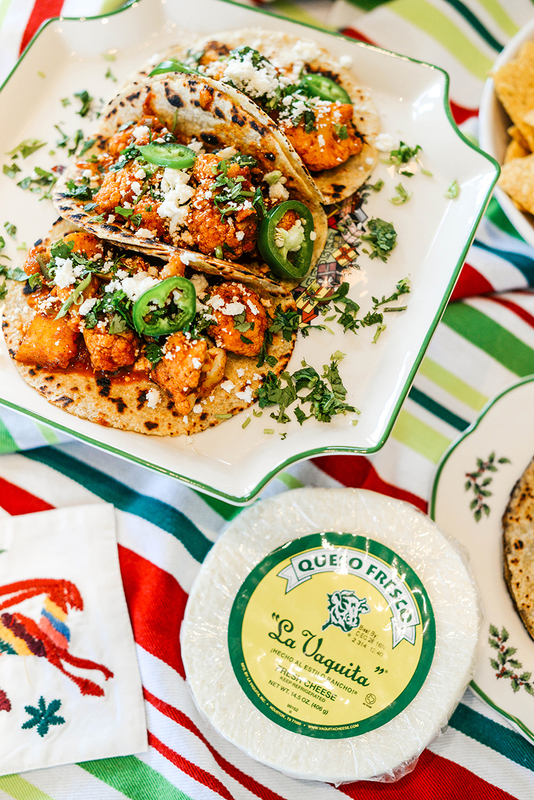 Divide the cauliflower among tortillas, top each taco with fresh cilantro, La Vaquita Signature Queso Fresco and sliced jalapenos. Serve immediately and enjoy! Sounds so delicious!! Love a good taco and surprisingly I’ve never had a cauliflower taco. I’ll have to try these soon! This sounds so great, Merritt! I’ll have to give it a try – thanks for sharing!! I love cauliflower. I cookes some cauliflower soup today. :) Thanks for the tips. OK this has my name written ALL over it!! !